You MUST read this post. Do you drink diet sodas thinking you are saving yourself from weight gain and excess sugar or corn syrup? Did you know that diet sodas are liked to obesity, heart disease, and brain cell death? Let’s examine. 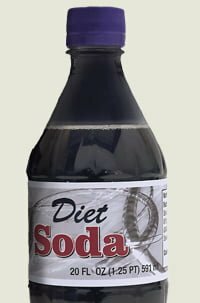 Firstly, diet sodas contain aspartame, a chemical that adds sweetness and takes the place of sugar so that diet sodas are low or no calorie. Aspartame and other fake sugar chemicals (NutraSweet, Equal, Sweet n Low, etc) are neurotoxic, meaning that they cause brain cell and neuron death. They are also classified as excitotoxins, meaning they excite or stimulate your neural cells to death. These chemicals have been linked to 90+ side effects such as migraines, dizziness, seizures, nausea, numbness, muscle spasms, weight gain, rashes, depression, fatigue, irritability, tachycardia (racing heart), insomnia, vision problems, hearing loss, heart palpitations, breathing difficulties, anxiety attacks, slurred speech, loss of taste, tinnitus, vertigo, memory loss, and joint pain. Why take this risk? Aside from this neurotoxin, diet sodas can cause weight gain. How could this be? Drinking artificially sweetened beverages (and eating other sugar free diet foods) “trick” the pancreas into releasing insulin, which increases fat storage, spikes appetite and carb cravings, causing weight gain. Increased insulin has been linked to heart disease. Adding insult to injury, sodas of all kinds contain phosphoric acid, which causes acidity, throwing off the body’s natural Ph. Acidosis causes disease in part because it increases free radical damage and degenerative disease. Phosphoric acid also leaches minerals from bones. 1. If you are bored with water, jazz it up with lemon & cucumber slices, or even ginger. 2. Drink herbal teas throughout the day or make homemade iced tea to sip on. 3. Are you drinking sodas for a lift? Try green or black tea, kombucha, or rejuvelac instead. 4. Do you have sugar cravings that you use soda to satisfy? Get to the bottom of what’s causing your sugar cravings: not enough protein? Too many refined foods? Too much sugar will cause you to crave more sugar. Is Sugar Killing Us? My Answer May Surprise You. What is the Best Diet for SIBO? I am so lucky that I haven’t had diet soda in years. As a young teenager, I took a sip of Diet Dr. Pepper and almost threw up- the chemical taste was so strong. I seldom drink soda (I probably average four litres per year), but when I do I stick to regular versions. Like they say, you can brush your teeth and go for a jog, but you can’t cure cancer!